Low productivity of staple crops is often attributed to the poor management practices of smallholder farmers. ‘Improved’ crop management practices for many staple crops in Ethiopia have been widely promoted. 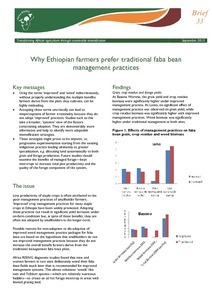 Adopting these practices can result in significant yield increases under on-farm conditions but, in spite of these benefits, they are often not adopted by smallholders in the longer-term.Possible reasons for non-adoption or dis-adoption of improved weed management practice packages for faba bean are based on the hypothesis that smallholders do not use improved management practices because they do not increase the overall benefit farmers derive from the traditional management faba bean plots. Africa RISING diagnostic studies found that men and women farmers in two sites deliberately weed their faba bean fields much later than is recommended for improved management systems. This allows volunteer ‘weeds’ like oats and Trifolium species—which are relatively nutritious fodders—to create an ad hoc forage intercrop in areas with limited grazing land. farmers derive from the plots they cultivate, can be highly misleading. intercrops to increase total plot productivity and the quality of the forage component of the system.